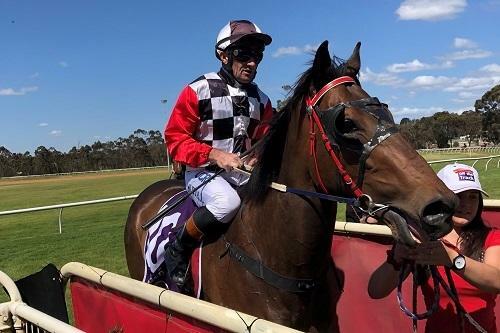 Bullet Train three-year-old Triggerfish made a winning return to racing for SJ Wolfe Racing at Mt Barker today, scoring by a short 1/2 head in the Bruce Williamson Memorial Maiden (Race 2-1200m) on the opening day of the Great Southern 2018/19 season. The promising youngster displayed good gate speed for jockey Peter Hall, but was forced to race a little wide throughout from the awkward alley. Shortly after straightening, Triggerfish dashed past his rivals, before holding off a late charge from the second placed Shezabutoo, when recording his first career victory. Triggerfish started the $2.80 favourite on the WAOP (Western Australian Official Price) following his encouraging trial display at Albany on October 26. Hopefully, it was the first of many winners for Team Wolfe this Great Southern season, following on from our 20th Trainer Premiership in the region from the past 22 seasons. Stable stalwarts Gauged and Red Noire made nice returns in the final event of the day, while Arrum Boy, Captivated Point, Mygirlfrankie and Round The Point all raced well and look capable of winning a race or two this season.